If you are in charge of project managing major industrial construction sites, you will know that there are a number of methods that can be used when deep holes are required. Diamond core drilling is one of those, which we at National Drilling recommend on many sites. 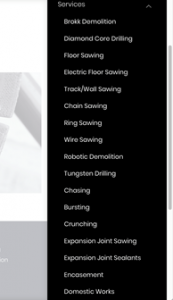 However, before we explain the benefits of diamond core drilling, let us just highlight why we are in a position to advise you about drilling practices. National Drilling is the UK’s leading provider of drilling services. Originating in the North West, our base is in the Stockport and Manchester area, but we have a number of regional offices and service sites across the UK. This includes our office in Ipswich covering projects in East Anglia and the South East. At National Drilling, we provide a range of drilling services and as a leading player in the industry, we are proud to be known for our reliability, expertise and good service. The main obvious benefit of diamond core drilling is that it has the ability to go to virtually unlimited depths, so if you know you need to dig deep then diamond core drilling is a good choice. The size of a hole that can be drilled using this drilling technique has a broad range of options, from as small as 10mm in diameter to as wide as 1000mm diameter, according to the site requirements. What’s more, using the diamond core drilling system, means that you can cut through most materials including reinforced concrete. 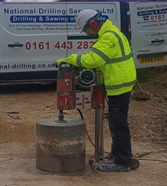 For further information about diamond core drilling and how it could be used on a construction site or project which you are managing, then do contact us. You can follow this link and phone the office nearest to your site or complete the enquiry form, or alternatively, email us at info@national-drilling.co.uk or call us 0161 443 2822.